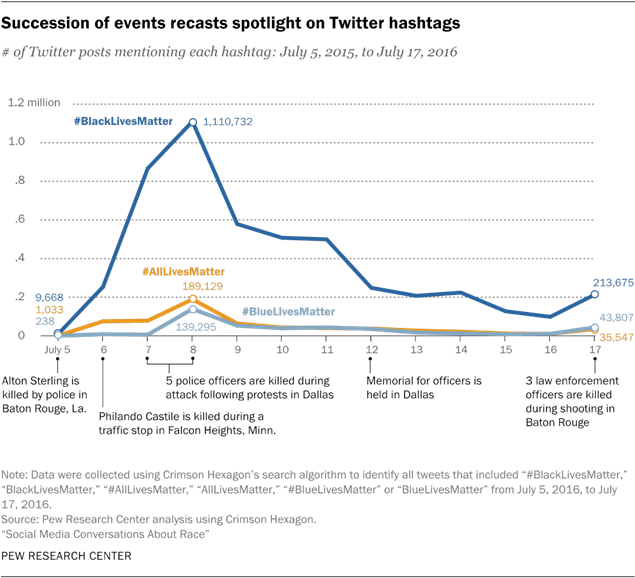 The weeks (July 5-17, 2016) following the shooting deaths of Alton Sterling and Philando Castile at the hands of police officers represent a highly active period regarding the discussion of the Black Lives Matter movement, as well as the use of #AllLivesMatter and #BlueLivesMatter on Twitter. During this period, major events caused a dramatic shift in the tone of conversation surrounding #BlackLivesMatter. There was a notable rise in the share of tweets criticizing the Black Lives Matter movement using that hashtag and a drop in the share of tweets that expressed support. Both of the shooting incidents were recorded and subsequently posted on social media. In the days following, there were two major attacks on law enforcement. On July 7, a gunman killed five and injured nine police officers in Dallas. Nine days later, another shooter attacked law enforcement in Baton Rouge, Louisiana, killing three officers and wounding three others. During this period, the use of these hashtags reached record heights. On July 8, the day following the Dallas attack, #BlackLivesMatter appeared on Twitter more than 1.1 million times. That was almost six times as often as the previous most-active day – Dec. 4, 2014 – when the hashtag appeared almost 189,210 times. In total, #BlackLivesMatter appeared nearly 5 million times during this time period, an average of more than 380,000 times a day following the death of Alton Sterling in Louisiana. On July 8, the hashtag #AllLivesMatter appeared almost 190,000 times, also more than six times as often as the previous most-active day – Dec. 21, 2014 – when it appeared about 28,500 times. During this 13-day period, it appeared more than 630,000 times. The hashtag #BlueLivesMatter, which was generally used as an expression of support for police, appeared more than 415,000 times during those 13 days. On July 8 alone, the hashtag was used almost 140,000 times. The previous highest count was 23,207 times on Sept. 9, 2015. While 41% of tweets using #BlackLivesMatter during this nearly two-week stretch supported the movement, a larger portion of the tweets using the hashtag opposed the movement than in the previous time period studied (33% compared to 11% in the earlier period). And this opposition increased dramatically after the attacks on police officers. Those supporting #BlackLivesMatter generally focused on the deaths of Alton Sterling in Baton Rouge, Louisiana, and Philando Castile in Falcon Heights, Minnesota. In fact, from July 5 to July 7, fully 87% of the uses of #BlackLivesMatter on Twitter were favorable, compared to 11% that were negative. However, following the attack on police officers in Dallas that began late on July 7, the tenor of the online conversation changed dramatically. From July 8 to July 17, 39% of tweets using #BlackLivesMatter were opposed to the movement, compared to 28% that were in support and 33% that were neutral. 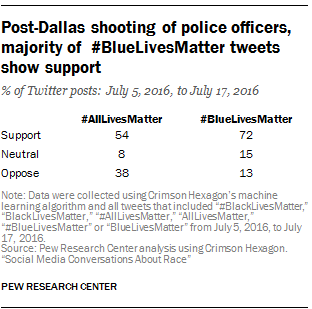 On July 17, the day the attack on police occurred in Baton Rouge, Louisiana, two-thirds of the tweets opposed #BlackLivesMatter (67%) compared to 26% that were positive and 6% that were neutral. The police aren’t perfect, but they save tens of thousands of black lives every year. No one believes #blacklivesmatter more than them. Many of the opponents blamed the #BlackLivesMatter movement for the attacks on police. In fact, nearly half of the tweets in opposition (15% of all tweets using the hashtag) during this period directly connected #BlackLivesMatter to violence. Many referred to #BlackLivesMatter as a terrorist organization. #BlackLivesMatter just killed two more cops in Baton Rough ? rt if you think #BLM is a terrorist group. This needs to end. As was true with the earlier period studied, #AllLivesMatter was mostly used as a reaction to the use of #BlackLivesMatter. Unlike the other times, however, there was a greater show of support in the use of #AllLivesMatter than opposition. From July 5-17, 54% of the times #AllLivesMatter was used it was in support of the concept, compared to 38% that opposed it and 8% that were neutral. Similarly, the hashtag #BlueLivesMatter was used to show support for police and oftentimes to show opposition to #BlackLivesMatter supporters. Unlike #AllLivesMatter, many fewer people criticized the use of the hashtag #BlueLivesMatter. In total, 72% of the times #BlueLivesMatter was used it was in support of the concept, compared to 13% opposed and 15% neutral. One frequent theme for #BlueLivesMatter supporters was criticism of President Obama for not doing enough to show support for police, and in some cases even blaming him for the attacks on law enforcement. In all, 13% of the tweets that included the hashtag featured an anti-Obama sentiment – about one-fifth of all the tweets that supported #BlueLivesMatter.